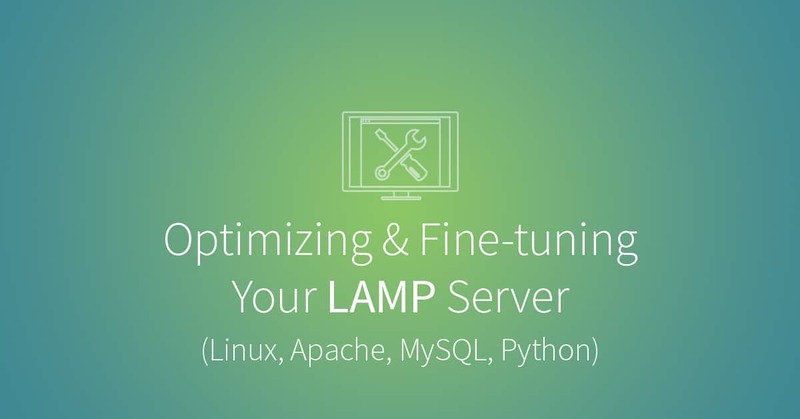 Once you have built a LAMP server on Ubuntu, the next important step is ensuring that every component on the server is optimized and fine-tuned. This will allow your website or web application to run much much quicker, leading to better overall stability. Previously, we built a LAMP server that consisted of either MySQL or PostgreSQL (and so both are covered here), and Python instead of PHP. Apache is our web server of choice because it is stable, well-supported, and completely open source. Out of the box, Apache works great for running websites and web applications, but could benefit from removing some unnecessary modules and fine-tuning. Apache is designed in a modular fashion so that web servers can be customized for particular needs. Popular modules add the ability to rewrite URLs, provide SSL encryption, and more. Apache comes with many of these modules enabled by default, however, which can mean unnecessary overhead and bloat on your server. Note that the modules enabled in the example and the modules you have enabled might look different. Note that after you enable or disable Apache modules, you will need to run sudo service apache2 restart. Perhaps the most important part of optimizing an Apache server is a proper configuration. If you have a misconfigured Apache server, your website or web application will start to choke under the pressure of a large number of HTTP requests, which will, in turn, begin bringing your entire server down. This happens because every HTTP request to your website or web applications requires RAM, and once your server runs out of RAM, it starts killing off processes that are using the most. This can happen, regardless of your configuration, if you suddenly get hundreds of thousands of HTTP requests every day to your server. But at the very least, we can help mitigate the problem. The code above is the configuration for the prefork module in Apache. This module is the most common method for Apache to serve HTTP requests. What we need to calculate now is the value we should have for MaxClients. To do this, we use the following formula: (Total Memory – Database System Memory) / Size Per Apache process. In this equation, you will be subtracting total memory either from MySQL memory or from PostgreSQL memory. So for my personal server — where I have 1992 MB of available memory, MySQL (or PostgreSQL) is taking up 21 MB, and the average Apache process is 22 MB — the equation would be MaxClients = (1992 - 21) / 22, which gives a value of 90 for MaxClients. Also note that if you are interested in the other configuration values in this file (StartServers, MinSpareServers, MaxSpareServers, MaxRequestsPerChild), Graham Dumpleton has a great presentation that explains the differences in each value and how changing them can affect your server. Unlike a lot of tools like Apache or Python, database systems are something that need to be regularly maintained. This is because your database size will likely change over time, as will the number of people querying it. However, we will be using a tool called MySQLTuner, which makes this maintenance easy. The script will give you a list of variables to adjust, which can be changed in /etc/mysql/my.conf. Similar to MySQL, for PostgreSQL we will be using a tool called PGTune to help with tuning our configuration. However, unlike MySQLTuner, PGTune is an online tool that allows you to input your hardware settings and primary database use, after which it spits out configuration settings that you can just copy and paste. In regards to Python, there isn’t terribly much that you can do on the server side of things to optimize your Python application much further. However, if you have written or are planning on writing a Python application, I recommend reading the official Python Performance Tips page to help in writing a performant application. With that, you should now have a fine-tuned LAMP server that you can deploy Python applications on, but which also isn’t hogging unnecessary resources or choking under the pressure of many HTTP requests.